The National Sardines Day is a food-related holiday observed annually on November 24. Sardines are a popular food regularly consumed by millions of people therefore they surely deserve their own national day. The term “sardines” refers to several types of small, oily fish belonging to the family Clupeidae. This term is thought to have come from the Mediterranean island of Sardinia, around which these fish used to be abundant. Sardines are a very nutrient-rich fish. They are high in vitamins B2, B3 and B12, vitamin D, calcium, phosphorus, potassium, selenium, and iron. They are also a valuable source of omega-3 fatty acids which are essential for normal metabolism but cannot be produced by the human body on its own. Omega-3 fatty acids are useful for our cardiovascular system. Sardines are typically sold canned. Before being canned, sardines are washed, beheaded, and cooked by steam-cooking or deep-frying. Then the fish are dried. They can be packed either in olive, soybean, or sunflower oil, water, or a tomato, mustard or chili sauce. Fresh sardines can be pickled, grilled or smoked. 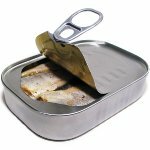 To celebrate the National Sardines Day, you can eat some sardines on toast or cook a more complicated dish containing sardines – it's up to you!